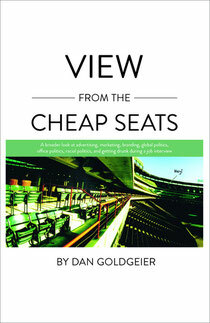 Since 2002, I've been the author of the "View From The Cheap Seats" column on TalentZoo.com. I've written over 200 columns offering a broader look at the advertising industry, day-to-day life in an agency, and the effects advertising and marketing have on our world. The best of my columns is now available on Amazon.com in softcover, old-school paper edition and Kindle edition.